Prince Albert of Saxe-Coburg and Gotha, Germany, was just 20 years old when he traveled to England to wed the youthful Queen Victoria in 1840. By all accounts this marriage, which resulted in nine children, was a love match and the Prince became the young queen’s most trusted and influential advisor. However, Prince Albert, who spoke heavily accented English, was considered a foreigner, and was never fully accepted by the English people. One can imagine how alone the young prince must have felt on his arrival in this unwelcoming land. Yet, one true friend could always be depended upon to provide companionship and affection — his pet Greyhound, Eos. At least three artists painted Eos’ portrait at Queen Victoria’s request. The most famous was by Sir Edwin Landseer. One of his paintings shows Queen Victoria, Prince Albert and one of the young princesses at home in Windsor Castle with three of their dogs — Eos, who is sitting at the Prince’s knee, and two terriers, Dandie and Cairnach. Thomas Musgrove Joy and George Morley also painted Eos. One of Morley’s paintings, dated 1841, shows Eos with two of her grown pups, Timur and Mishka, in a country setting beside a fence. Another Landseer painting shows Eos with the baby princess, Victoria, the Princess Royal. In this delightful picture, Eos is snuggled up against the baby princess whose toes are resting on Eos’ nose. Another Landseer portrait, painted as a birthday present from the Queen to Prince Albert in 1844, shows Eos with the young Princess Alice and was done from memory, as Eos had died the previous month. The most widely recognized painting of Eos is the one accompanying this article. 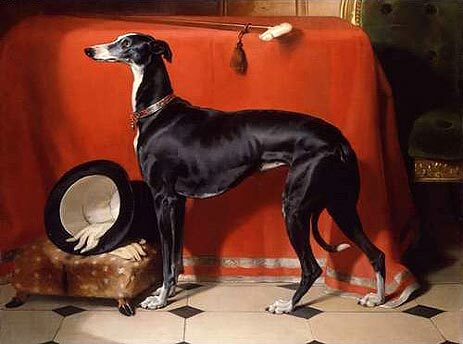 This painting by Landseer has appeared in books, on posters, on the Web, and on the notecard shown here, which was purchased at the Greyhound Hall of Fame. (Other distributors of Greyhound paraphernalia also carry these cards from time to time.) Queen Victoria commissioned this painting in 1841 as a Christmas present for Prince Albert. In her journal dated December 24, she writes of the Prince’s delight with it and that it came as a complete surprise. After Eos’ death, Prince Albert used this portrait in the creation of a monument to Eos, which was installed on the Slopes at Windsor. (The Slopes are the hilly part of the Home Park between the castle and the river.) A recent call to the Castle confirmed that a statue of Eos is still there. Special thanks to Michael Maguire, author of Swiftly, for his help in researching this article.